2018 has been a record breaking year of fundraising by the Naption Golf Society. It has been led all the way by our Captain Danny Gleeson, who has carried out a 12 hour Putting Marathon as well as a very successful Captain’s Charity Day Raffle and Auction. 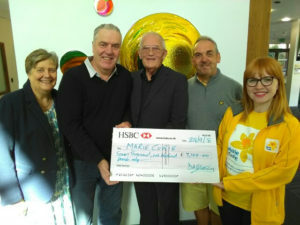 On Friday September 28th , Danny was on hand to present a cheque for £7,100 to Marie Curie in Solihull. Once again, the committee would like to thank Danny for all his efforts this year and being a pleasure to work with.